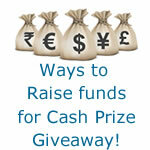 →Cash Prize Giveaway ~ How To Raise Funds For The Competitions! These prizes will be sent to Paypal. If you don’t have a possibility to receive by Paypal, you can always get it through a friend or have something bought online and sent to you. Why do bloggers do cash prize giveaways? Let me use this opportunity to throw in some light about cash prize giveaways and why we do it often. Recently on this blog, I have had 3 blog commenting cash giveaways in about 3 weeks. 4 winners were selected and a total of about $225 paid out cash. I still will be doing more of this so don’t think I’m done with. When I looked at my traffic stats, there was a serious jump forward. That means there is positive reason to run these competitions. One strong reason is the reward you give your readers. If you are like me, you know that your blog readers are most precious. While you may think you give them worthy contents, giving them an opportunity to win cash doing what they do often on your blog is a very cool idea and a motivating factor. I could as well use that amount $225 on Facebook ads or Google Adwords. That would have been lack of application of knowledge. The benefit of running cash contest on your blog (in terms of traffic, engagement and even SEO) are more than anything you will get with paid traffic. Pay 6 bloggers ($50 each) to blog about my contest and link to it. That would have been a total of $500 spent right? 6 backlinks from the 6 blogs. Longterm direct traffic from the 6 blogs. Build a strong relationship with the 6 bloggers. Offer my readers monetary reward thereby building more trust. Grow my social media base – more likes, tweets, G+, followers. Benefit from the effect of viral traffic generated by Punchtab. I think for bloggers, these are just outrageous benefits. If you have an ecommerce shop, you may consider otherwise. You see why I like the idea of cash contests and giveways? I know this is the hard part of the whole thing. Most of us would love to run these result driven competitions but what holds us back are the prizes. Giving out something tangible as prize is a good option. However, it has to be hot and unique. Some bloggers give out themes, plugins, webhosting, etc. The problem with this kind of prize reward is that, evidently, not everyone that comes across the contest will have compelling reasons to take part. If you are running a commentLuv Premium plugin giveaway, you are not going to impress me. I have it already. So you limit yourself big time, giving out some prizes that are in possession of a cross section of bloggers. Everyone’s attention is peaked when it comes to cash. Everyone needs cash. Cash is the highway to anything you want. Yes! With cash, you can buy anything – online and offline. That’s why doing cash contest or giveaways always gets a lot more attention from around the globe. 1 – Team with friends: This is often good to start with. If you are 5, you can come together and put $25 each. That will amount to $125. People will still get mad at winning it. Then you can co-host the sweepstake on your blogs. With PunchTab, it will be easy and I think you can really benefit from mass exposure doing this. 2 – Get sponsors: This is my most favorite method. I have had many advertisers sponsor contest and giveaway that I run. That’s simply because I set out to give them exposure. No one is just going to give you $150 because you want to run a sweepstake. For the most past, just a simple link and mentioning them on the giveaway post is not enough. I resorted to doing complete review of their products and that has proven to work. A complete review of their products. Banner ads on your blog for them. Writing an irresistible business letter! Do you know that you can write a business letter that’s hard for advertisers to resist? There are some key points you need to raise that will keep them begging for your Paypal account email to send you money. I have mentioned a couple of times here on my blog that advertisers need exposure and the more you give them, the more you get paid for it. Have you done cash prize giveaways before? What where your results? How did you raise the funds for the prizes? Do you intend to do more of these competitions? I’d like to hear you out in the comment box below. WOW. this is amazing information Enstine. I have been wondering how you manage to giveaway this much cash. I am so happy to say that I took your advise very seriously about a month or two ago when you were talking about operating your business from one blog. I had said to you that my “business generating” blog was separate from my main one and is where i run most contests. You said that your opinion is that giveaway is great for traffic. So i have moved my blog to wordpress as explained last week and its giving me flexibility to combine these two blogs. Most of my clients are giving me kindles to give away. Now i am wondering if I should just ask them for the cash rather. Now, you know what your audience is interested in. As this is the first, maybe you give the kindles a try first before requesting cash. From the first giveaway, you will know what’s up next. And so I soldier on Enstine. thank you. See I meant it when i said i learn something everytime i come over. Mr. Enstine, i had been enjoying every of your single updates about making money with blogs, this particular post went further more to be an eye opener for other blogger who wants to grow in the business like you. Seems like something has been changed in this blog’s design and its better too. The ideas are rally unique and wonderful to apply and earn some additional money. I like your idea of rewarding readers with cash prizes and no doubt it’s better than spending money on any marketing campaign. You know what? Cash prize giveaways are working as a marketing campaign for you, i’m not a regular visitor of your blog but i’m a blogger and when you announce giveaways like this one then my social profiles get filled up with your giveaway URLs because people love what you are doing, you are helping them to earn money and they help you in marketing your blog. By the way, i have a question. What’s the best method to reach sponsors who can sponsor cash prize giveaways? I’m dealing with different companies for a long time and it’s really difficult for me to convince sponsors for cash giveaways, although most of the time they agree to provide free product copy but they don’t agree for sponsoring cash giveaways. The quick way to get to those sponsors who can sponsor with cash is to find advertisers who are currently buy space on other blogs. Most of them already have a budget for publicity. Visit other giveaways and contact those who sponsor them. Chances are that they will listen to you. Go to emperola.com and visit those contests, find out if they are being sponsored. Contact their sponsors. Hey bro, great blog post man. Thank you for including my cash giveaway as well 🙂 Really appreciate it! A very formidable insight on how to raise funds for cash prize giveaways. The two methods pointed out should be revealing to many who are not knowledgeable about how to start. The second method of using sponsors is also my favorite. It is a WIN WIN situation for all! Thanks for the wonderful comment. I’m sure this will help us raise funds for this traffic oriented activity.